If you're not bothered by AI's that have emotions, add one more star. 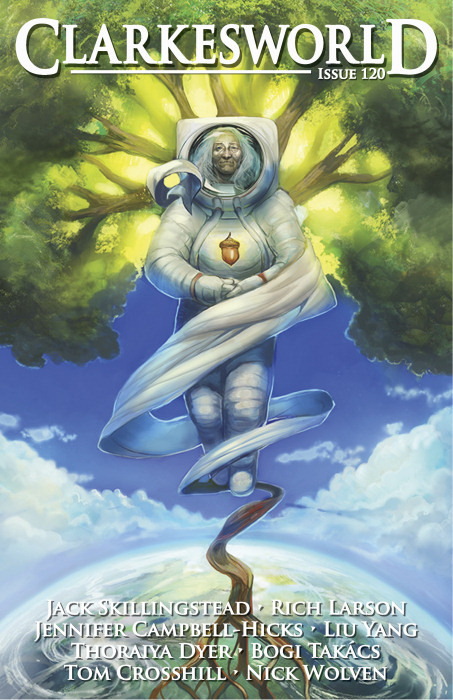 "Aphrodite&apos;s Blood, Decanted," by Jennifer Campbell-Hicks [bio] (edited by Neil Clarke), appeared in Clarkesworld issue 120, published on September 1, 2016. Pro: It's a sweet little tale of how the lonely Factory learned that the humans were never coming back, but that he had a wonderful companion right across the river, so he didn't need to be lonely. The fish coming back were a nice touch. Con: It reads like a children's story, with talking buildings. Even the rhetorical questions to the reader are similar to what you find in children's books. On the practical front, where was the power coming from? And even if you believe in emotional AI that can "evolve" from an OS, would the foundations of a building really shake when one of them was disturbed? A cute story that reads like a fable. Yes, the buildings are sentient, but so is Thomas the Tank Engine, and he's pretty groovy.